How can we shape the neighbourhoods of an immigration society? How can abandoned and unused spaces benefit the community trough reusing? Is it possible to create Migratory Neighbourhoods? Urban realities are continuously changing under pressure of increasing population sizes. Cities are a spatial concentration of human activity and interaction, of development, innovation and creativity. At the same time, they are also places where problems arise, such as overpopulation, unemployment, poverty, social tension, prejudice, racism, as well as pollution, ecological disruption, loss of biodiversity and sealed soil surfaces. The current development plan for Berlin is based on ideas and numbers of the past while lacking adaptations to the drastic in population growth, offering no perspective to low-income families and immigrants. Each year tens of thousands of additional homes are needed. 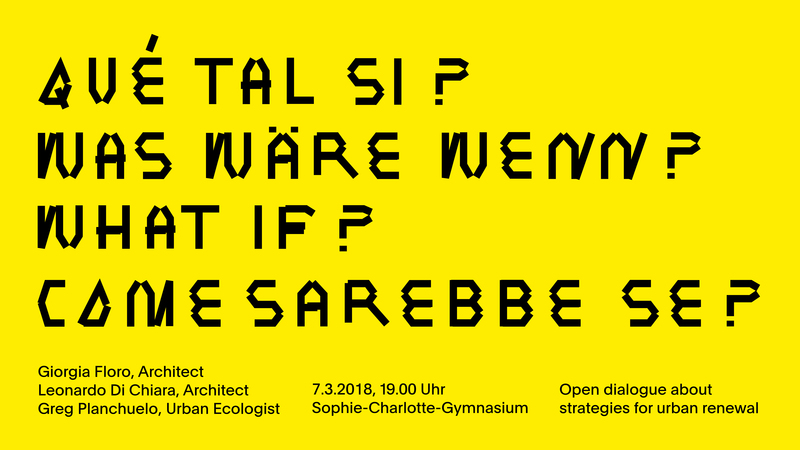 We invited two young architects and an urban ecologist to talk about the future of our cities and new cultural and democratic approaches to education and building. 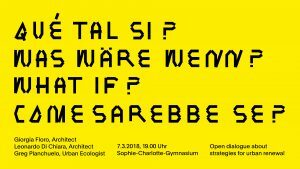 The open talk will be held by students of the Sophie-Charlotte-Gymnasium in Berlin and is co-funded by the Erasmus+ Programme of the European Union. Giorgia is a young Italian architect who is interested in urban regeneration. After attending the Temporary Reuse Course at the „Politecnico di Milano“, she is exploring how unused and abandoned spaces can be reused through the creation and involvement of the community. She was awarded with the Berlin Prize and is currently also working with RAUMLABOR Berlin. Builder of the „aVOID Tiny House“ and member of the Tinyhouse University, the young Italian architect established Migratory Neighborhoods, a model which aims at integrating tiny and mobile structures on wheels into big cities. Recently awarded with the Berlin Prize, he is carrying out a research in collaboration with berliner architectural firm GRAFT focused on the relationship between new technologies and the re-thinking of densified urban spaces. The 28 year old Spanish biologist and ecologist is currently focus on the enormous diversity of urban ecosystems and how it can be harnessed by city planners to create functional and sustainable environments. He is currently doing his PhD about urban ecology at the “Technische Universität Berlin” and holder of a scholarship from the Hans Böckler Foundation.